Castlewood Canyon State Park, once rural and fairly remote, today is nearly embraced by suburbia. As residential development creeps ever closer we gain even more appreciation for natural areas set aside and protected for public enjoyment. Cherry Creek flows through Castlewood Canyon. In the late 1800s a 600-foot-long dam was complete to store water vital to ranchers and farmers. Almost from the beginning the dam leaked causing concern downstream in Denver. Engineers debated safety issues until the the early morning hours of August 3, 1933 when the dam gave way releasing 1.7 billion gallons of water. The raging torrent scoured canyon walls as it surged towards Denver. A slide show in the visitor center relates the story of Castlewood Dam and the second worse flood in Denver history. Castlewood Canyon stands in a transition zone between mountain and plain. Ecologically unique on the rim of the Black Forest plateau, four ecosystems – grasslands, montane shrublands, montane forest and riparian – exists within walking distance of one another. A wide variety of foliage, flowers, birds and wildlife can be found within the park. 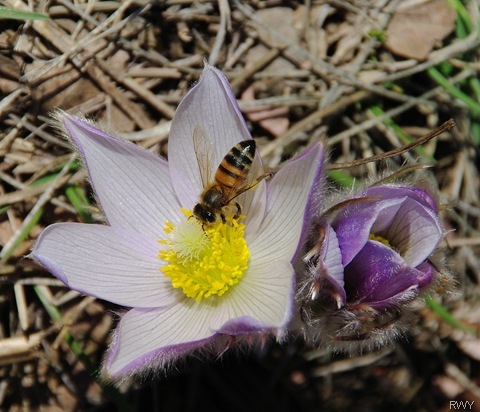 On our springtime visit we observed mountain bluebirds and photographed pasqueflowers emerging from winter groundcover. 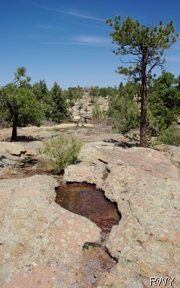 Hiking trails offer access to the dam ruins and Lucas homestead historic sites, the falls area, inner canyon, and rim rock. Several trails interconnect creating loops of two, four or six mile hikes. The paved Canyon View Nature Trail is handicap accessible with excellent canyon viewpoints. To the west the mountain panorama stretches from south of Pikes Peak to Rocky Mountain National Park. The state park is a day-use park open 8am to sunset. There are two entrances to Castlewood Canyon State Park. The main (east) entrance is off CO83, five miles south of Franktown. Facilities include the visitor center, flush restrooms, picnic areas with grills, group picnic area, amphitheater and paved roads and parking. The west entrance is accessed off CO86 via Castlewood Canyon Road. This portion of the park is less-developed with gravel road and parking lots, a few picnic tables and pit toilets. Parking at the dam ruins is prohibited, you must hike in (.35-mile trail) from the designated parking area. Rock climbers find challenges in the western section of the park. Biking and horseback riding are limited to the Cherry Creek Regional Trail. When You Go: Visitors are required to display a current Colorado State Parks Pass, available at the visitor center and self-service dispensers. A daily pass is valid from the day of purchase until noon the following day. Click here for information on an annual pass. Numerous naturalist guided activities,including Canyon Kiddies for ages 2-5, are available each month, call the park at 303-688-5242 for current schedule and registration.